The UJP series has been discontinued. Please see the SJP Series as a possible alternative or contact our Temperature Engineering department. 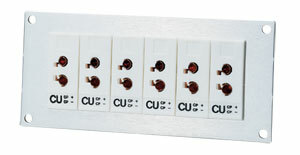 The UJP universal jack panels are the first and only panels that work with both standard and miniature connectors. This innovative design means you don’t have to mix standard and mini panels, and it eliminates needless duplication of panel equipment. The jacks are compatible with EVERY standard and miniature connector, no matter what size. The jacks are molded of high-impact plastic and have a maximum service temperature of 205°C (400°F). The panels are machined from rugged 2.3 mm (0.09") aluminum with a brushed finish. Clear anodizing adds durability and corrosion resistance. In addition to the sizes and styles shown, OMEGA can custom manufacture these universal jack panels to your individual specifications. Simply provide overall dimensions, quantity, number of rows and calibration(s) of jacks desired, and OMEGA will make the panel to meet your needs.